World food programme (WFP), a united Nations (UN) organisation has resumed distribution of food in Karamoja region. WFP is an organisation distributing porridge flour to the malnourished children and mothers particularly Super cereals plus-plus (CSB++). WFP resumed the exercise mid last week and it was unveiled by preparing porridge which they all ate together with the locals to prove to the world that it’s completely safe for humanity. 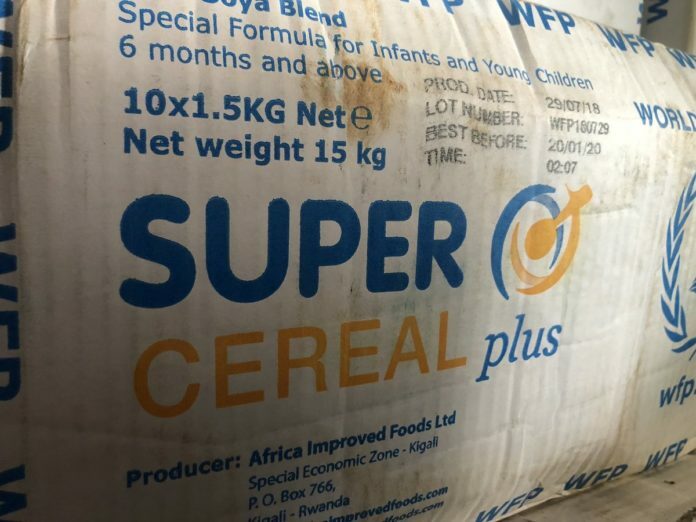 WFP faced hard time last month when four people died after consuming WFP super cereal fortified blended porridge flour. It was then suspected to be poisoned, this prompted them to suspend distribution of this nutritious cereals flour in Karamoja region for some time, to pave way for investigations. It was confirmed that 120 families out of those that received the super cereal flour, developed health complications and admitted in critical condition. Both in the districts of Napak and Amudat at Alaskas Health centre II. Eventually the situation left four dead and others survived after receiving treatment. These victims manifested symptoms including high fever, vomiting and mental confusion. Following this happening government together with WFP Officials agreed to carry out that joint investigation on the matter to establish the possible cause of the outbreak. Tests done in Uganda showed no poison in the porridge, but now they are still waiting for the results from the samples taken to Kenya and South Africa. UN WFP head Karamoja field office Mr Mohamed Satti, confirmed the developments. Satti said the porridge flour they are serving now are different from the one that created health issues to people of Karamoja claiming lives as well. Satti said the super cereals plus-plus (CSB++) porridge given out now is confirmed by ministry of health in Uganda.